I read alot of media and I actually saw a reference to this particular article and I read it. The writer is so consumed with his own hatred of former Obama confidant Stephanie Cutter that he actually talks about her black roots. Raelly that has alot to do with her role on the revamped Crossfire. Read the link and share your thoughts. Is President Obama enjoying the GOP race for the presidency? 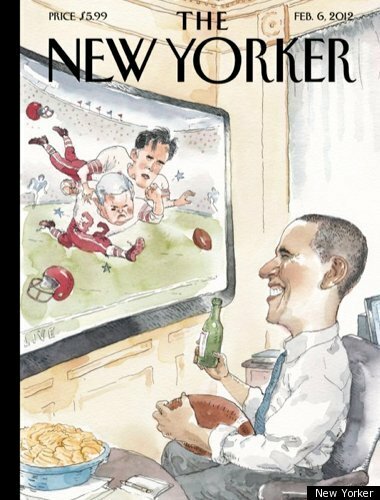 The current New Yorker cover says it all, and the President is probably enjoying every minute of it. Over the past few days I have seen footage of Sen. Obama attempting to bowl. He can’t. He bowled a dismal 37. So what. The media have had a field day with this. Hillary Clinton even did an April Fool’s Day joke regarding this incident. The reason Sen. Obama was doing this was because he was in Altoona, Pennsylvania and this is what the locals do for fun. The Senator is not a pro-bowler. He was just having a little fun. The media has been analyzing this as if it were a foreign policy speech. Did it hurt him? Was this a Dukakis in the tank moment? Why did he keep his tie on? Will the Reagan Democrats see this as pandering? Listen folks he bowled. He bowled badly. That’s it. Obama is trying to appeal to everyone. The president is everyone’s president, but that does not mean he or she can do everything. When he gets to Philly and plays some round ball he will have the opportunity for redemption in the hearts of sportsmen. Here’s another newsflash Obama can’t walk on water either. When you are driving and come to a stop sign what do you do? (A) Stop (B) Cruise through it or (C) Think about stopping. Well if you believe in rules you will stop. A stop sign is a command it is not a suggestion. We are a nation of rules and this is what keeps us from experiencing chaos. So let’s look at the rules regarding primaries. Michigan and Florida were told not to move up the dates for their primaries. If they did move them up they would not be seated at the convention and their votes would not count. They knew this and they did it anyway. Now the Clinton campaign is calling for their votes to be counted. They clearly violated the rules, but she needs the votes so forget the rules. She even got a group of her well-healed contributors to put up the money to finance a re-vote, but that too has failed to work. Even if it had worked there is something innately wrong with private citizens financing elections. Clintonites claimed the people in these two states are being disenfranchised if they are not allowed to be seated at the convention. These people were not disenfranchised-these people broke the rules, and now they are dealing with the consequences. “An act of betrayal,” said James Carville, an adviser to Mrs. Clinton and a friend of Mr. Clinton. “Mr. Richardson’s endorsement came right around the anniversary of the day when Judas sold out for 30 pieces of silver, so I think the timing is appropriate, if ironic,” Mr. Carville said, referring to Holy Week. This is the over- the- top reaction of Clintonite James Carville. It borders on being an act of treason for Governor Richardson to support Sen. Obama. To be compared to Judas– the most notorious biblical character– is absolutely insane. The Clintons’ desire for fanatical devotion is almost comical if it were not so frightening. Gov. Richardson is an American who has the right to make up his own mind. Carville throws out the 30 pieces of silver analogy. What did the Gov. get for the endorsement? As far as we know nothing. He decided it is time for a change. It is time for a new breed of leadership. If Gov. Richardson is Judas, is Hillary the Savior? I think not. She is a candidate that believed she had the Gov. in her pocket, and he decided to move in a new direction, and for that he is called a traitor. No, for that he should be called an American. This election year has been full of fascinating twists and turns. Hillary Clinton started this saga as the presumptive nominee. Barack Obama, the first viable black candidate has been bogged down by the fanatical musings of his former pastor. To be president you have to have teflon skin. You need to be transparent. Every relationship in your life is potential fodder for the media. Your spouse is also fair game. One misstep becomes tomorrow’s headline. You travel non-stop and are forced to shake hands with everyone within a city block of your speaking venue. You have to kiss babies. and wait and have your photo taken with virtually all the cellphones in the place. You have to state your case without offending anyone, and if you do you have to be ready with the requisite apology. You have no privacy and you get no rest. Cartoonists draw pictures that emphasize your most unattractive features. You can find jobs in corporate America that pay 10 times as much as the salary of the president. So why would anyone want the job? I believe that each of the candidates” Obama, Clinton and McCain truly love this country and each one of them wants to do what is right for the country. They vehemently disagree on how to accomplish it, but they each have the passion and desire to try. So as this primary season descends further into the mud, I tip my hat to the candidates that love this country and will endure the hardship for the chance to make a difference. Yesterday we witnessed one of the most direct speeches addressing race that we will ever hear. Sen. Obama talked passionately about the racial divide that plagues our country. He addressed Rev. Wright’s vile remarks. He did it with grace and passion and now is the time to move on. The speech has been dissected by all the print and electronic news media. Some people feel he did enough, and others don’t ,and that’s ok. It was an appeal to his base, and they walked away satisfied. Some people never had any intention of voting for the Senator so he has lost nothing with that group. Some people who voted for him in earlier primaries needed to hear him and they too walked away more comfortable. What he has to do now is move on and start addressing the issues that concern us: Iraq war, economy, job loss, college costs and future retirement. Start talking again about the issues that brought you this point. It is time to stop explaining, apologizing and move on. We are ready for you to keep your stride and stop looking back. You can’t change the past, but you can impact the future. So continue the chant of “Yes We Can”, and the time is now. Over the past few days I have seen the Jeremiah Wright tapes aired over and over again on all the network and cable outlets. This morning I saw Al Shaprton on Fox news and the newsmen were talking about it and also the possibility that Sen. Obama was present at one of these tirades. I found this very curious. I know the church sells the sermans on tape, but how can you prove or disprove if someone was present or not if they are not on the tape. To do that would require some collusion with some staff member and I can’t believe our “sainted” media would stoop to that level. (Tongue planted firmly in cheek) This whole notion of if the Sen. had been present he could have walked out is not necessarily true. The black preacher is still a respected member of the black community. Politcos seek their approval because of their influence over their congregation in particular and the community at large. You don’t just walk out in the middle of service. In some churches no walking is permitted while the pastor is speaking. You can not apply rules from traditional churches to the activities of the black church. Rev. Wright’s comments were indefensible and I don’t believe that everyone present shared his radical perspectives. When the tapes are played it almost seems like it was one vile message, but what we are actually seeing is a complilation. This has been to topic of conversation for the past few days. The market is still in trouble, we’ve been mired in Iraq for 5 years, uemployment is rising, gas prices are at an all time high, food is going up everyday and we are still talking about a preacher from the southside of Chicago. Let’s just accept the black church offers more than a worship experience and move on. This has been a rough week for Sen. Obama. Tapes of his spiritual mentor Rev. Jeremiah Wright have made their way into the mainstream media. The tapes reflect some of the radical opinions that Rev. Wright espouses. This was a gotcha moment for the press! They were literally salivating with glee. However, Sen. Obama took the high road and said he found some of the preacher’s remarks apalling. He did it admirably because he refused to throw his pastor under the bus. He repudiated the remarks, but not the person. He explained that this man led him to Christ, performed his wedding and christened his children. In other words this is his friend. In a campaign like this others would have cut him loose, and not looked back because right now the only thing they can see is 1600 Pennsylvania Ave. I applaud the Sen. for acknowledging this kind of rhetoric has no place in this campaign, but also standing by his friend. The irony in this scenario is the Rev. has proven to the skeptics (Sen. Clinton included) that once and for all Sen. Obama is not a muslim. He is a Christian who acknowledges the man who brought him to Christ 20 years ago is still his friend.